While most people look back on their first overseas vacation with rose-tinted glasses, senior tax officer Rita Balasurian remembers being confined in her maternal grandparents' village in Jaffna, on her first trip to Sri Lanka. Then 13, she spent the first of the three-week holiday in isolation to "be protected from evil spirits", as part of a coming-of-age ceremony to mark puberty. During the confinement, she ate traditional fare such as raw eggs with gingelly or sesame oil, fried chicken and brinjal juice. These foods are believed to help build up the immune system and were prepared by her grandmother. Now 56 , she recalls: " I was quite depressed as I was stuck in a room with nothing to do. But I was happy to go through the ritual, as my grandparents saw me arrive as a child and leave as a woman." The ritual culminated in a grand feast where she was showered with pal rotti (milk and pieces of bread), coconut water and water. It was attended by 200 relatives and villagers. She says: "It was like a huge wedding. I was dressed in a nice sari and each of my relatives blessed me and gave me jewellery." 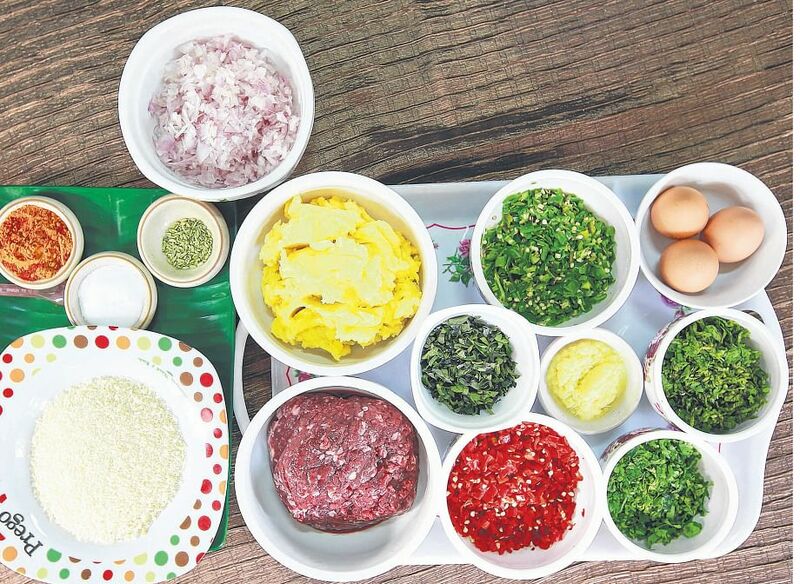 One dish associated with Sri Lankan festivities is mutton cutlet, which is one of the 177 recipes featured in a cookbook on Ceylonese Tamil cuisine, From Heart To Palm, by Ceylon Sports Club. The cookbook was launched last week by Deputy Prime Minister and Finance Minister Tharman Shanmugaratnam, who has Ceylonese roots. Proceeds from sales of the cookbook will go towards funding community initiatives in the Ceylon Tamil community. The publication of the book is part of the community's celeb- rations to mark Singapore's Golden Jubilee. Mrs Balasurian is a committee member of the 87-year-old club. These days, she cooks the mutton cutlets during family meals on weekends or on special occasions. "It's my family's favourite snack. It can be easily popped into the mouth and goes well with beer, or it can be used as a sandwich filling." When she was 16, she had to take over cooking duties when her housewife mother fell ill.
"My mother was protective of the kitchen as it was her territory, but I often peeped and watched her cook." Soon, her mother taught her traditional Sri Lankan recipes such as mutton and fish sothi (coconut- based curry) and fish cutlets. Mrs Balasurian is also an avid baker and turns out sugee, butter and chocolate cakes, scones and cream puffs. When she was 16, she got hooked onto baking after making bread and butter pudding for her father, and was rewarded with a Morphy Richards electric mixer two years later. She co-owned a bakery in 1995, but closed it down after a year to spend more time with her family. Her four children, aged 22 to 33, started helping out in the kitchen when they were eight years old. They helped make dishes such as soup, potato salad and garlic bread. 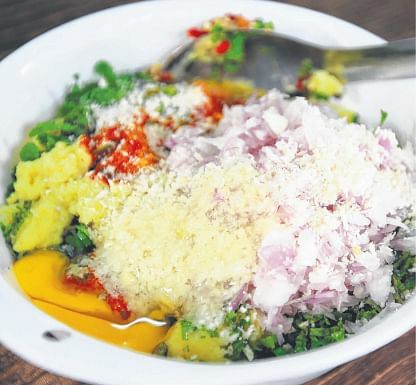 Her oldest son, Ruben, 33, an air steward, has progressed to cooking Sri Lankan dishes such as fishhead curry, fried mutton liver curry and fried fish roe, and jots down these treasured recipes. 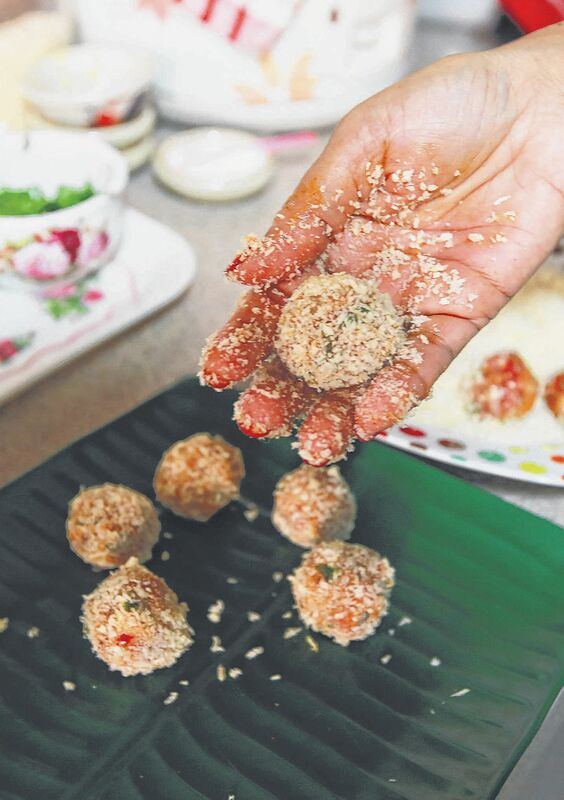 Mrs Balasurian, who is married to a 61-year-old associate engineer, says: "One should learn how to cook to truly enjoy food. I regretted not learning some recipes from my mother, such as green bean balls. I don't want my children to regret that they cannot make these foods when I am not around, as they are not available in eateries." •From Heart To Palm - The Culinary World And Culture Of The Ceylon Tamils In Singapore costs $20 and is available at the Ceylon Sports Club in 101 Balestier Road and Sri Senpaga Vinayagar Temple in 19 Ceylon Road. 1. Place minced mutton and mashed potatoes into a large mixing bowl. 2. Add green and red chillies, curry leaves, mint leaves, coriander, meat curry powder, cumin, pepper, crushed fennel seeds, ginger and garlic mix and onions. 3. Beat in two of the eggs, add some breadcrumbs and salt to taste. 4. With a spatula, mix the contents well until they become a dough-like lump. 5. Roll out 15g balls of the mixture. 6. Beat the remaining egg. Dip the meat balls in the egg and coat them with the breadcrumbs. Set the cutlets aside for 10 minutes before frying to ensure that the breadcrumbs stick to the cutlets. 7. Heat the sunflower oil in a pan over high heat. Throw a pinch of breadcrumbs into the oil. If the crumbs sizzle, the oil is hot enough. 8. Turn heat down to low and fry the cutlets in batches for three to five minutes until they turn golden brown. Serve.